Wimbledon Lawn Tennis Museum020 8946 6131work Museum Within the walls of the award-winning Wimbledon Lawn Tennis Museum is a remarkable new addition. A state of the art 3D film by Sony entitled ‘Viewpoint’ which is being showcased from today in their museum cinema.Viewpoint, which gives a rare and exciting insight into the factors that contribute to making The Championships so special, was produced during this year’s tournament and will be an awe-inspiring development for the Museum. Skilfully orientated around the Men’s Singles Final of The Championships, this unique cinematic experience captures the sights, sounds and people of Wimbledon through its split narrative. The film opens on Centre Court during the final game of the tournament, focusing on the players in action. The audience is then seamlessly led from this central scene to the world of some of the rich characters that make The Championships the magnificent occasion that it is. Weaving characters stories together to build a picture of what goes on behind the scenes, the film’s seamless transitions and compelling narrative introduces the audience to the often hidden heroes of The Championships; innovative cinematography uses 3D technology to allow the filmmakers to masterfully captivate the visual climaxes of the film. This new cinematic technique zooms in and out of time and space itself, in a multitude of directions, seamlessly interlinking the people and places that make the day so uniquely special. Bringing together an old technique called 'Pepper's Ghost' with new projection and filming technology, the museum is able to create an exciting way to view a scene from Wimbledon's past. In a recreation of the 1980s Gentlemen's Dressing Room, a ghost-like image of John McEnroe appears and takes you through a tour of the normally off-limits area. McEnroe reminisces about his memories about the Dressing Room, including how he first met Jimmy Connors and how he would emotionally prepare himself for matches. The fashions of Wimbledon continue to be a point of attention and significance to the story of tennis and the new Museum will house an extensive collection of Wimbledon attire. Everything from outfits worn in the 1880s to Rafeal Nadal's dri-fit 'pirate' trousers worn in 2005 are on display. There is also an interactive exhibit where you can feel the weight difference between male and female clothing in 1884. Interactive touch screen consoles are evenly distributed throughout the Museum hallways. These information access points make up a part of the new and exciting technologies within the Museum. Other features are the 'Get a Grip' rotating wheel of rackets; 'The Reactor' game and an archive of great past Championship matches, all of which can be enjoyed by visitors of any age. Within the walls of the award-winning Wimbledon Lawn Tennis Museum is a remarkable new addition. A state of the art 3D film by Sony entitled ‘Viewpoint’ which is being showcased from today in their museum cinema.Viewpoint, which gives a rare and exciting insight into the factors that contribute to making The Championships so special, was produced during this year’s tournament and will be an awe-inspiring development for the Museum. 10am - 5:30pm; last entry 5pm. •There are no Tours 14 June - 18 July. •The Museum is open with no Centre Court viewing 15 June - 27 June & 15 July - 17 July. •During The Championships the Museum is open to Championships ticket holders only. Usual admission charges apply. £11 Adult, £9 Concessions, £6 Child (5-16). Under 5s free. The Wimbledon Lawn Tennis Museum and Shop are easily accessible from GATE 4 of the All England Lawn Tennis Club, situated on Church Road. From central London take the A3 Portsmouth road and just before Tibbet's Corner, turn left onto A219 towards Wimbledon. Down Parkside, then turn left into Church Road. 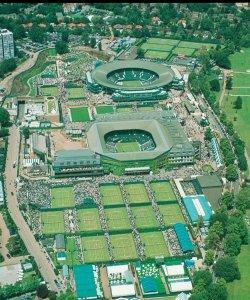 Do not use the postcode SW19 5AE to locate the AELTC via Sat-Nav. The AELTC lies between SW19 5AG and SW19 5AF. There is very limited car parking inside the grounds for visitors to The Wimbledon Lawn Tennis Museum between August and May. BY PUBLIC TRANSPORT - All visitors are strongly advised to use public transport services wherever possible. Bus 493 runs from Richmond to Tooting, connecting with the District Line at Southfields. The 493 also runs from St George’s hospital via Plough Lane to Alexandra Road next to Wimbledon mainline station. Go to Wimbledon or Southfields on the District Line or Tooting Broadway on the Northern Line, then take Bus 493. There is a regular train service from London Waterloo to Wimbledon Station. At Wimbledon train station take the 493 bus. There is a regular tram service from East Croydon to Wimbledon Station. At Wimbledon train station take the 493 bus.